It’s worth queuing for Kêu’s banh mi: the bread for these tip-top Vietnamese sandwiches stands comparison with the best in London. 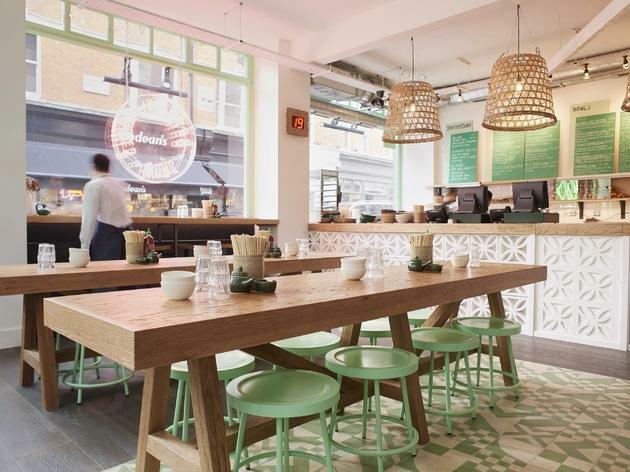 Kêu (which is pronounced ‘that sandwich shop on the corner’) is a new Vietnamese café in Soho that’s a branch of the Cây Tre and Viet Grill restaurant chain. The principal offering here is bánh mì, filled Vietnamese rolls. And the most important element of a great bánh mì is the roll itself. A crackly, thin crust should give way to soft, airy crumb; it’s not a French stick, and shouldn’t feel as heavy. When we took our first bite here, we knew that we were in the presence of roll models: they couldn’t have been better. And later we learned that they’re made for Kêu by the Sally Clarke Bakery, one of London’s best. This is not to say that the fillings were negligible. The ‘Classic’ combo contains slices of roast pork with cucumber sticks, coriander leaves, red chilli and pickled carrot and daikon. Simple, but good. The vegetarian option combines deep-fried tofu chunks with roasted aubergine and the aforementioned salad. Both cost £7.10 eat-in. Other fillings include pork or mackerel. Apart from bánh mì there are several rice bowl combos that are more broadly Vietnamese-inspired; if our braised beef brisket was anything to go by, you’re better off sticking to the bánh mì. But the plump, bouncily-textured summer rolls (a side dish, £5 for four pieces) are refreshing and thoroughly enjoyable. To drink there are huge pots of tea and curvaceously retro Coke bottles. But best of all, in our view, was the off-menu Vietnamese dripped coffee (£3.50 each). A layer of condensed milk is placed in the bottom of a glass and a tiny steel coffee filter placed on top for the Cà Phê VN grind to filter into the glass below. The result of this drug ritual is sweet and addictive. 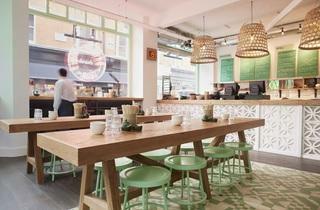 To read a review of the first branch of Kêu, in Shoreditch, click here. Lunch for two with Vietnamese coffee: around £20. I only had their banh mi, it was decent for lunch. I need to go back there to try their pho. We popped in here when we couldn't face queuing for the popular Bao. The atmosphere was light and airy, and the service friendly. The starters and the beer we ordered were delicious, however I was disappointed with my main course of soup - it was very greasy and the meat was unpleasant. My partner was very happy with his meal. I may return to try the Banh Mi, as I've heard good things. So far I've only had experience with keu's take away service and every time it has done the trick of delivering perfect, comforting asian lunch time food for those "Ugh" days int he office. Both the baguettes and the traditional pho's are tasty, but the few times i went for one of the exotic sounding specials I was usually disappointing. Make sure when visiting Pho you've got some time, because service is really slow. In the late 1970s, my parents set off in a rickety boat from Vietnam and amid being stranded in the South China Sea and being picked up by a Scottish cadet training ship, they arrived here in the UK and started a new life for themselves.Bearing in mind what they have been through, my parents are not easy people to impress but I recently brought home a couple of Keu's banh mi for my dad's birthday and they got nothing but glowing reviews. (My dad being a man who declares all Vietnamese food aside from his own "not as good as home-made" and has eaten a freshly-extracted snake's heart as a drinking snack with nary a shrug). So you can only imagine how good the banh mi is here. Keu manages to balance the traditional (the crispy and airy Saigon style baguettes; tangy pickles) with a twist (non-traditional banh mi fillings such as curried shorthorn meatballs and braised mackerel). It also manages to offer Vietnamese dishes which aren't easy to find elsewhere in London (shout out for the hu tieu my tho - think a lighter, more fragrant version of ramen which is less rib-sticking than it's Japanese cousin). If the only banh mi you've ever had is a dry, half-baked version that is touted in Eat then you definitely need to reconsider the banh mi with a trip to Keu. In fact, even if you've had a great banh mi, try out the ones in Keu. They're officially Viet-approved.